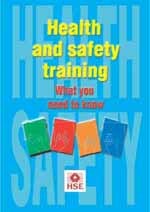 Health and Safety Training-What you need to know. This leaflet explains the importance of health and safety training to owners and managers of businesses. It gives advice on who may need training, what form the training may take and how to organise it.